The 7th and 8th Canadian Infantry Brigades opened their attack on Calais and its western coastal defences at 10:15am on 25 September after a day's delay, following preparatory air and artillery bombardmenets. The Régiment de la Chaudière were to advance through Escalles, taking Cap Blanc Nez, and link up near Sangatte with the North Shores Regiment. The North Shores had the difficult task of taking Noires Mottes, high ground near Sangatte that had been heavily fortified and where Battery Lindemann was located. 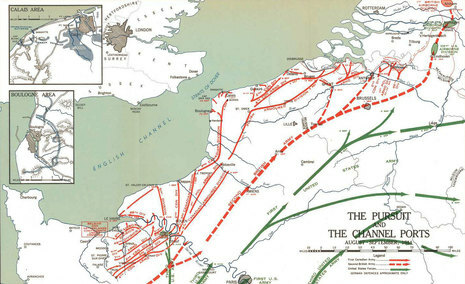 In order to shield Canadian activity around Cap Blanc Nez and Calais from observation and interference from the batteries at Cap Gris Nez, a large smoke screen was established along a three kilometre line inland from Wissant. This was successfully maintained for five days. The capture of Cap Blanc Nez proved to be unexpectedly easy. As soon as the Chaudieres' assault reached the first defences, the surrender of the whole Cap Blanc Nez was offered. This was completed just two hours later, most defenders reportedly being dead drunk. The North Shores' attack on Noires Mottes was supported by flail tanks from the 79th Armoured Division and gunfire from the 10th Armoured Regiment on the approach through minefields and by Crocodiles to reduce fortifications. Early attempts by small groups of Germans to surrender were discouraged when they were shot down by their own side. The advance was held up, however, by a combination of effective defence and bomb craters that prevented the Crocodiles' advance before nightfall. Negotiations were opened with the help of German prisoners and the Noires Mottes garrison surrendered at first light on the following morning, 26 September. A formidable defensive position had been captured cheaply. It appears that the Sangatte battery was also surrendered at the same time. Examination of the forts showed that they had been heavily booby-trapped.